pet,	or one that people are asking questions about. Although there have been human cases of Ebola in the US, these cases resulted from direct contact with a person infected with the Ebola virus and showing obvious signs of illness. Ebola is a zoonotic disease, because it can be passed between certain animals and people. Ebola may have originally spread to humans from infected fruit ats, apes or monkeys, but is now primarily spread from person to person through direct contact. Although a study has shown that some dogs in Africa have been exposed to the Ebola virus, there is no evidence that they become ill or spread the disease to people or other animals. In the current West African outbreak, animals have not been found to be a factor in the ongoing spread of the disease. Ebola is NOT spread through the air or water or by mosquitoes. You or your pet would need to be exposed directly to the blood or body fluids of a person or animal that is infected with Ebola in order to be at risk for infection. Just as the risk of you becoming infected with Ebola is very low, your pet's risk of becoming infected with Ebola is extremely low, especially when you compare this risk to the preventable, yet deadly, diseases like parvo, distemper, and rabies to which our pets may regularly be exposed. The American Veterinary Medical Association, CDC, and the US Department of Agriculture do not believe that pets are at significant risk for Ebola in the United States. It's always a good idea to avoid contact with people or animals that are obviously ill, regardless of what may be making them sick. This includes their blood and body fluids. Although bats in the US are not known carriers of Ebola, they can carry rabies. contact with bats should be avoided as a general rule. While not a common menu item for most of us, there are people who eat bushmeat (wild animal meat) that may be imported from Africa. This is a potential source of infection, so you should avoid eating any of this meat. If you have been exposed to someone infected with Ebola, or if you feel you may be infected, contact your physician immediately. If your pet has been exposed to someone infected with Ebola,m contact your veterinarian immediately. If your pet is ill — regardless of the cause — or if you have questions about your pet's health, contact your veterinarian. The ongoing epidemic of Ebola in West Africa has raised several questions about how the disease affects the animal population, and in particular, the risk to household pets. While the information available suggests that the virus may be found in several kinds of animals, CDC, the US Department of Agriculture, and the American Veterinary Medical Association do not believe that pets are at significant risk for Ebola in the United States. How are animals involved in Ebola outbreaks? Because the natural reservoir host of Ebola has not yet been confirmed, the way in which the virus first appears in a human at the start of an outbreak is unknown. However, scientists believe that the first patient becomes infected through contact with an infected animal, such as a fruit bat or primate (apes and monkeys), which is called a spillover event. Person-to-person transmission follows and can lead to large numbers of affected persons. In some past Ebola outbreaks, primates were also affected by Ebola, and multiple spillover events occurred when people touched or ate infected primates. In the current West African epidemic, animals have not been found to be a factor in ongoing Ebola transmission. Ebola is not spread through the air or by water, or in general, by food. However, in Africa, Ebola may be spread as a result of handling bushmeat (wild animals hunted for food) and contact with infected bats. Only a few species of mammals (for example, humans, monkeys, and apes) have shown the ability to become infected with and spread Ebola virus. There is no evidence that mosquitos or other insects can transmit Ebola virus. What if there is a pet in the home of an Ebola patient? CDC recommends that public health officials in collaboration with a veterinarian evaluate the pet’s risk of exposure to the virus (close contact or exposure to blood or body fluids of an Ebola patient). Based on this evaluation as well as the specific situation, local and state human and animal health officials will determine how the pet should be handled. Can I get my dog or cat tested for Ebola? There would not be any reason to test a dog or cat for Ebola if there was no exposure to a person infected with Ebola. Currently, routine testing for Ebola is not available for pets. 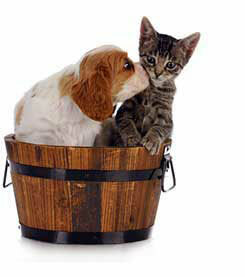 CDC regulations require that dogs and cats imported into the United States be healthy. Dogs must be vaccinated against rabies before arrival into the United States. Monkeys and African rodents are not allowed to be imported as pets under any circumstances. Each state and U.S. Territory has its own rules for pet ownership and importation, and these rules may be different from federal regulations. Airlines may have additional requirements. Yes, monkeys are at risk for Ebola. Symptoms of Ebola infection in monkeys include fever, decreased appetite, and sudden death. Monkeys should not be allowed to have contact with anyone who may have Ebola. Healthy monkeys already living in the United States and without exposure to a person infected with Ebola are not at risk for spreading Ebola. Fruit bats in Africa are considered to be a natural reservoir for Ebola. Bats in North America are not known to carry Ebola and so CDC considers the risk of an Ebola outbreak from bats occurring in the United States to be very low. However, bats are known to carry rabies and other diseases here in the United States. To reduce the risk of disease transmission, never attempt to touch a bat, living or dead. Where can I find more information about Ebola and pet dogs and cats? CDC is currently working with the U.S. Department of Agriculture, the American Veterinary Medical Association, and many other partners to develop additional guidance for the U.S. pet population. Additional information and guidance will be posted on its website as well as partner websites as soon as it becomes available.